OTTAWA, April 4, 2017 /CNW/ – CannaRoyalty Corp. (CSE: CRZ) (OTCQX: CNNRF) (“CannaRoyalty” or the “Company”) today announced the Company’s financial results for the three and twelve-month periods ended December 31, 2017. All figures are reported in Canadian dollars ($), unless otherwise indicated. CannaRoyalty’s financial statements are prepared in accordance with International Financial Reporting Standards (“IFRS”). In 2017, our team worked hard to position the Company for long-term growth with the California market as a foundation. Those efforts culminated in several strategic transactions over the past four months that have transformed CannaRoyalty into one of the largest and best-positioned cannabis players in California. Our market-leading distribution business places us in an ideal position to be a partner of choice for leading brands and dispensaries across the state. Over the next twelve months we will continue to concentrate on: leveraging our market-leading position in California to drive top-line performance, bringing both CR Brands and licensed products back to Canada, and rationalizing legacy, non-core investments to drive focus in our business and value for shareholders. 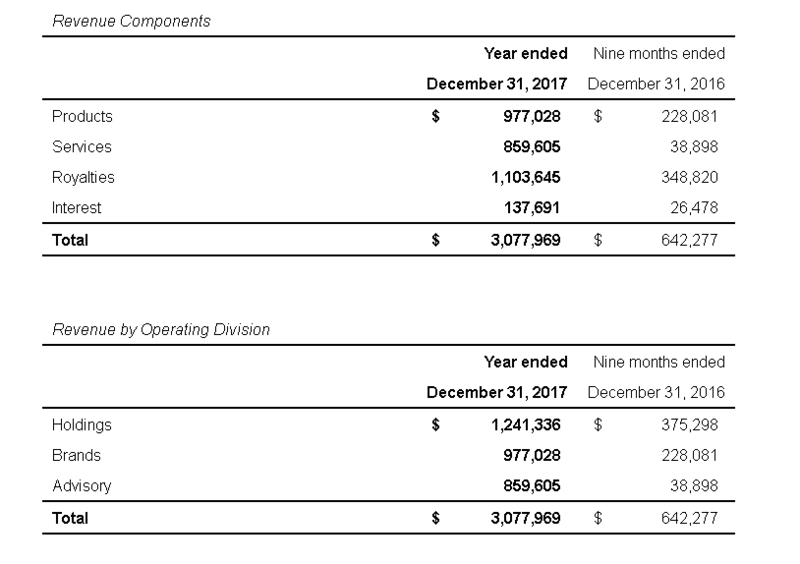 For a comprehensive overview of CannaRoyalty’s Recent Developments, please refer to the Company’s Management’s Discussion and Analysis of the Financial Condition and Results of Operations for the Three and Twelve Months Ended December 31, 2017. Total assets of $46,139,757 as compared to $32,197,938, an increase of 43%. Total investments1 of $26,674,288 as compared to $8,363,922. Cash and cash equivalents of $4,522,644 as compared to $2,945,895. 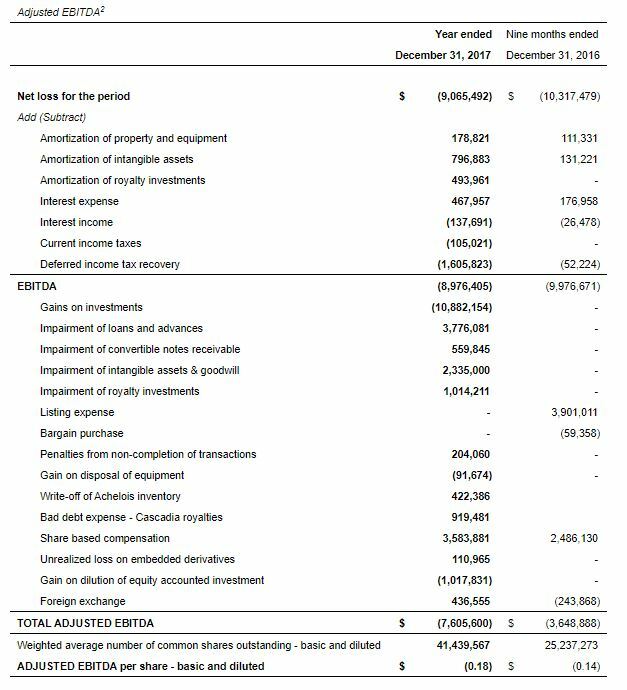 For an overview of developments related to CannaRoyalty’s top holdings, please refer to the Company’s Management’s Discussion and Analysis of the Financial Condition and Results of Operations for the Three and Twelve Months Ended December 31, 2017. 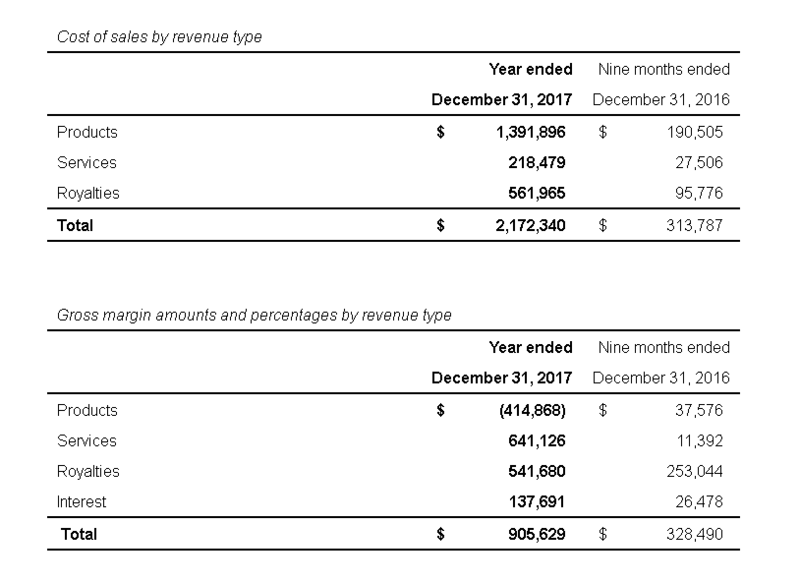 The following tables set forth consolidated statements of financial information for the three and twelve-month periods ending December 31, 2017 and December 31, 2016. 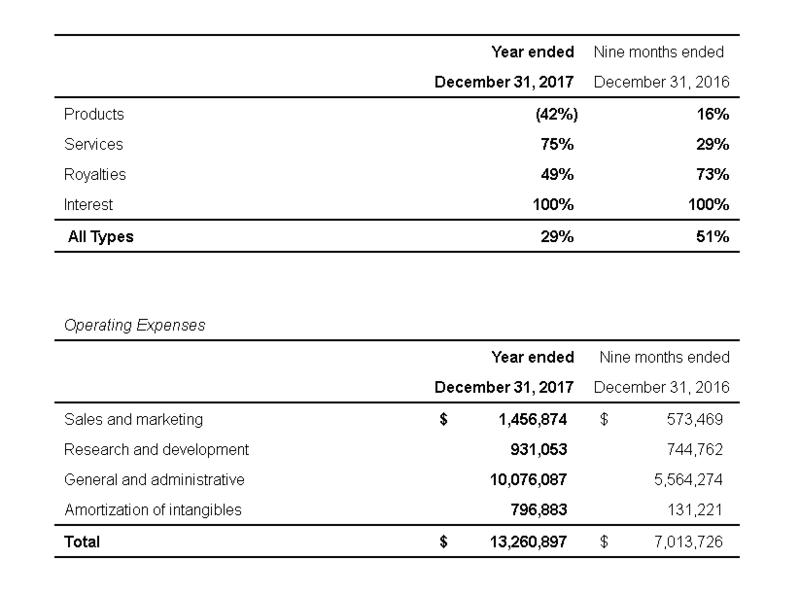 For further information regarding the Company’s financial results for these periods, please refer to the Company’s Management’s Discussion and Analysis for the periods ended December 31, 2017 and December 31, 2016 and the Company’s Financial Statements for the periods ended December 31, 2017, published on CannaRoyalty’s issuer profile on SEDAR at www.sedar.com and the Company’s website at www.cannaroyalty.com. ²Adjusted EBITDA and Adjusted EBITDA per share are non-IFRS measures. 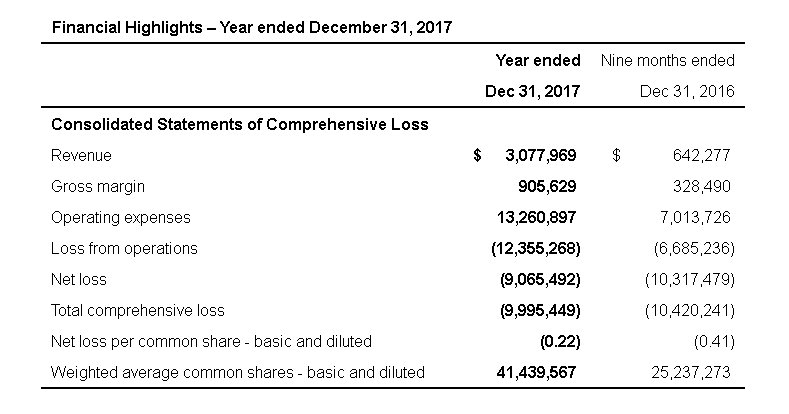 See “Adjusted EBITDA” in the Company’s Management’s Discussion and Analysis for the three and twelve-month periods ended December 31, 2017. Increase commercial production and gradually drive efficiencies. At this relatively early stage in the growth of our in-house brand portfolio, we are focused primarily on driving distribution reach, brand awareness, and customer loyalty. Our efforts on the brand-building side are beginning to bear fruit and in February 2018 we won six industry awards for our work on Soul Sugar Kitchen. We are also dramatically scaling our distribution and logistics network across California, through our recent acquisition of Alta Supply Inc. (“Alta Supply”) and agreement to merge with River Distribution (“RVR”). In March 2018 we consolidated the California manufacturing and distribution rights to global award-winning Bhang® brand vaporizer and Bhang® edibles products under Kaya Management Inc. (“Kaya”), which is now a wholly-owned subsidiary of CannaRoyalty. Bhang® products are some of the most awarded cannabis products, globally. Combined, Kaya and the former manufacturer of Bhang® edibles produced approximately US$8.0 million in revenue in 2017. In Q1 2018, we moved all CR Brands manufacturing and product development functions to Kaya’s Oakland facility, which currently produces Bhang® products for the California market. We expect the combined manufacturing revenue from Kaya will drive substantial quarter over quarter growth through the remainder of 2018, starting in Q2. Since my last letter, we have also capitalized on a new opportunity with Floracal® Farms (“FloraCal”), a leading premium craft cannabis cultivator in Sonoma County, to develop and sell branded cannabis products as well as to jointly execute an expansion of FloraCal’s cultivation footprint into our Santa Rosa facility. Given the size and scale of the California market, cross-state distribution is a critical element of our platform. We also view distribution as one of the most strategically compelling components of the highly regulated cannabis value chain in California. The acquisitions of Alta Supply and RVR will give CannaRoyalty a leading cannabis distribution and logistics network in the world’s largest regulated cannabis market. Together, these businesses generated revenue of US$31.9 million in 2017. With our distribution platform, we are well positioned to rapidly expand the sales and reach of existing brands that are looking to access shelf-space across the state, as well as for dispensaries seeking access to a full spectrum of top products and brands. We can also leverage this infrastructure to do the same for our own brands. As the Canadian market moves closer to the sale of cannabis consumer products, we are assembling substantial know-how, intellectual property, and brands to bring back to Canada. Since November, we have significantly advanced our focus on this area and anticipate a continuation of this in the months to come. Some of the successes we have had in this area include an exclusivity arrangement for the license of MüV products and two deals focused on establishing Canadian retail access for CR Brands products. Recently, we have also established Trichome Yield Corp., to offer secured lending solutions to companies operating across the Canadian cannabis value chain, nominated an experienced board of directors and executed our first deal with a leading Canadian online and retail vaporizer products company. Most of our long-term investors are aware of our roots as a diversified investment vehicle. As I outlined last quarter in my shareholder letter, in Phase I of our growth plan, we invested in a basket of companies in value-added areas of the legal cannabis market in North America. Our shift to Phase II of our plan, which is well underway, has involved consolidation of core assets that further the Company’s strategy, and rationalization of assets that are non-core. Our acquisition of 100% of RVR is an example of the former, and the announcement of our joint venture with Aequus Pharmaceuticals, to which we intend to contribute our stake in Bodhi Research & Development Inc., is an example of the latter. To support the Company’s strategic focus and rationalization, we have made some difficult decisions regarding two early CannaRoyalty investments, Rich Extracts and Cascadia. As any early stage growth investor knows, despite the best efforts of a dedicated, professional team, investments don’t always work out the way you anticipate they will. While we are working to protect our investments in these situations, substantial capital and human resources would be required to realize returns at this stage. Conversely, we also realized significant gains on other positions such as Anandia and AltMed and a significant increase in the implied value of our Resolve position, supported by a recent equity financing. Today, I am more confident than ever in our ability to realize our objectives and create significant shareholder value. Our team more than doubled from Q4-2016 to Q4-2017 and I am proud of the contribution of that each of those team members and each member of our team of dedicated advisors, has made to our substantial progress in 2017. Many thanks for your ongoing support. I can say with confidence that this is just the beginning of our exciting and profitable journey together. The Company’s authorized share capital is an unlimited number of common shares of which 43,898,445 were issued and outstanding as at December 31, 2017 (December 31, 2016 – 36,006,956 common shares). The Company has issued 4,153,150 RSUs that have not been exercised as at December 31, 2017 including 1,933,587 that have vested (December 31, 2016 – 2,774,800 including 1,065,637 that had vested). As of December 31, 2017, there are share purchase warrants and broker warrants outstanding that can potentially be converted to 4,112,712 shares (December 31, 2016 – 1,113,633). CannaRoyalty will host a conference call on, Wednesday, April 4, 2018 at 8:30 a.m. (Eastern Time) to discuss its 2017 fourth quarter and full year financial results. 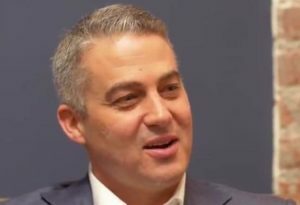 The call will be chaired by Marc Lustig, Chief Executive Officer, François Perrault, Chief Financial Officer and Afzal Hasan, EVP Corporate Development and General Counsel.